Well, this one was a real treat! It has been quite a while since I’ve seen a really good science fiction film, and Arrival really was good science fiction. That being said, it won’t be for everyone. Sure I loved the latest Star Wars movies but those are really more fantasy science fiction films this was in my opinion a true science fiction film. It made you think, and if you paid attention, things were pretty obvious and made perfect sense. The film opens with quick clips, almost like a dream, of a mother’s relationship with her daughter, from her birth through childhood to her premature death in adolescence from an incurable disease. Twelve alien ships simultaneously arrive at different places on Earth. One in America, one in Russia, one in China, one in the UK, one in Australia, and so forth. Hovering above the planet, the ships silently wait as the armies and scientists of the world approach and study them. In America, linguistics professor Louise Banks (Amy Adams) and Ian Donnelly (Jeremy Renner), a mathematician lead one of the teams attempting to make the historic “first contact”. On-board the alien crafts they meet the seven-limbed aliens, who they call “heptapods”, and they begin attempt communication first by creating a written language. The heptapods of course don’t look like we do, don’t sound like we do, don’t breath like we do, and seemingly don’t exist in dimensions the way that we do, so it is no surprise that their written language is nothing like ours, but eventually the team finds a way to decipher the circular symbols that they use for their words. Naturally with humans being involved the process isn’t that easy, as some groups seek to attack the aliens rather than wait to see what they want. It’s a race against the clock between militarized factions and science, with a “gift” promised by aliens as the reward and the fate of our planet hanging in the balance. The film asks some pretty deep questions. What is the gift? Are the aliens giving each area only one-twelfth of their message to force humanity to unite and work together? Why would the aliens offer a gift to Earth? And why is Louise dreaming about a child she has never had? I really enjoyed this one, it won the Academy Award for Best Sound Editing, and was nominated for seven other categories including Best Picture, Best Director, and Best Adapted Screenplay. I really think Amy Adams deserved a Best Actress nomination, but for some reason that didn’t happen, though she was nominated for the Golden Globe. The characters were well written, and the acting was top notch all around, as was the sound and the visual effects. The film draws some comparisons to Close Encounters of the Third Kind and Contact, but never feels like it is a simple derivative. The story unfolds rather well, and for a moment, it seems like there is a massive twist in the plot, but a moment later you begin to realize there really is no twist, but just the realization that the film had already explained itself to you. Arrival was a smart and sophisticated sci-fi that even those who don’t love sci-fi will enjoy. Bottom Line: Arrival was based on the Ted Chiang’s short story “Story of Your Life” which was first published in 1998. Also, I really wanted to talk about the reveal here, but it’s a massive spoiler, just watch it for yourself! The first time I had heard of Ernest & Celestine was back when I was preparing to dominate my staff Oscar pool for the third year in a row. Nominated for Best Animated feature, it stood little chance against the juggernaut that is Walt Disney’s Frozen, but still, this beautifully animated story caught my eye. Now I’m glad to say that thanks to the home video release, I’ve watched and highly enjoyed it. 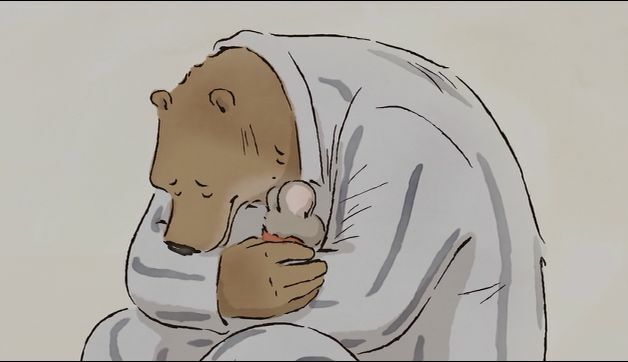 Based on a series of children’s books of the same name from Belgian author and illustrator Gabrielle Vincent (the nom de plume of Monique Martin), Ernest & Celestine tells the a touching story of a bear and a mouse. Mice live below ground, and bears live above ground, with the two societies rarely interacting and mostly living in fear of each other. Baby mice are told fairy tales of the “big bad bear” who will eat them. Baby bears are told of the fairy mouse who will take theith teeth. The mice do indeed take the bears’ teeth, when the parents first act as tooth fairy, the mice come by and take the tooth again. Bear teeth are the strongest teeth and mouse society has been built by their use of their own teeth, as they gnaw and chew the landscape away to fashion their world. Celestine is one such dentistry mouse who is sent to the surface to steal teeth that are used to replace damaged mouse molars. One evening she is caught by a bear family and trapped until the next morning when Ernest, a kindly, down on his luck bear frees her from her garbage can prison. Celestine then helps Ernest find some food by showing him the basement of a candy store, coincidentally owned by the same bear who trapped her. Celestine and Ernest begin a friendship and help each other until Ernest is found in the mouse city. The two escape the pursuing police from both societies and hide in Ernest’s house in the woods away from the bear town. Eventually each are caught by the opposite police and put on separate trials; trials that will open the eyes of both mouse and bear societies. As I said, this was a nice, simple story that touched on prejudice, xenophobia and friendship with very light fingers. I was very nice to see an animated film that wasn’t overly CGI (I think I read that it was entirely hand drawn), and I really loved the flowing watercolour look of the film. 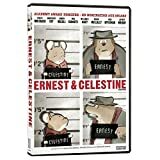 Originally Ernest & Celestine was voiced in French but had so much success at various film festivals, it was converted into English with stars Forest Whitaker taking over for Lambert Wilson as Ernest; Mackenzie Foy voiceing Celestine for Pauline Brunner. Paul Giamatti, William H. Macy, Nick Offerman, Megan Mullally and Lauren Bacall rounded out the English voice cast. Bottom Line: lovely film, and very nice to hear Lauren Bacall one last time, and this picture just kind of summed up the entire film.